A federally-mandated law requiring semi-truck drivers to log their hours behind the wheel has gotten plenty of pushback, but is still scheduled to go into effect Dec. 18. Later this month, the U.S. Department of Transportation is set to begin implementation and enforcement of an Electronic Logging Device (ELD) mandate. Adopted in 2015, the USDOT gave truck drivers a two-year period to install the technology into their trucks – which most mega-carriers already have. An ELD is connected to a semi-truck’s Engine Control Module and to the internet via cellular or satellite connection, or both. The device monitors and reports vehicle speed, distance traveled, as well as hard braking and evasive maneuvers. It then sends out two reports – one to a dash display in the form of hours logged (which is by law available to police), and the other to the trucking company in the form of a safety report. Equipping a semi-truck with an ELD costs around $2,000, plus additional monthly fees for internet data. The Federal Motor Carrier Safety Administration is allowing use of the ELD mobile application for cell phones, a much cheaper option. Federal law puts truck drivers on a 14-hour clock – with 11 of them permitted to be spent driving – followed by 10 hours of rest. The clock is running whether they’re driving, in traffic or waiting on a load. The FMCSA, which oversees trucking companies, estimates that the ELD mandate will save 26 lives and prevent 562 injuries each year that are caused by large vehicle crashes. It’s no secret that semi-trucks and other large vehicles put passenger vehicles at risk, and the ELD mandate is designed to save lives and curb fatigued truck drivers. Drowsy, sleepy or fatigued driving is a serious issue. The National Highway Traffic Safety Administration (NHTSA) estimates that 100,000 crashes are the direct result of driver fatigue each year. This results in an estimated 1,550 deaths and 71,000 injuries, not to mention $12.5 billion in monetary losses. In truck drivers specifically, fatigue is a factor in 13 percent of commercial trucking accidents, according to a study commissioned by the FMCSA. The ELD is designed to cut down on these catastrophic accidents. If you’re involved in an accident involving a semi-truck, hiring the right personal injury attorney can make all the difference. Attorney Chris Davis – founder of Seattle-based Davis Law Group, P.S. – has over 20 years of experience representing victims in these accidents, and knows the right steps to winning your case. In many situations, Mr. Davis will analyze the log books that truck drivers are required to keep. If a driver is out of compliance, the data found – whether in a paper log or electronic device – can be used to establish negligence and liability. Semi-truck accidents can leave you and your loved ones suffering from severe physical and emotional injuries. 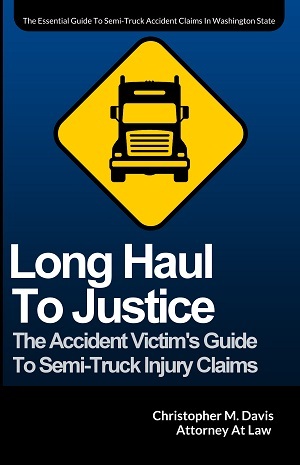 Davis Law Group represents those injured in semi-truck accidents. Mr. Davis and his legal team will thoroughly investigate your accident and determine causation and liability using tools such as electronic logs to determine if the driver was out of compliance. Contact Davis Law Group today for a free, no-obligation evaluation of your case. Call (206) 727-4000, use the chat feature below or fill out the form on this page.